We are so proud to announce that we are hosting "So. Cal's Natural Beauty Pageant" on June 19th (Father's Day) in Riverside Ca! We are promoting Self-Love, Confidence and Acceptance for our Natural Beauty AND all at the same time we are helping our Education Crisis.This is a special event and look forward to it becoming an Annual Event. WE ARE CASTING FOR OUR CONTESTANTS! THIS IS NOT A TRADITIONAL PAGEANT! 3. Want to start/continue being of service to their communities! "Our pageant focuses on the natural beauty we all possess. The purpose of our Natural Beauty Pageant is to promote self-love, confidence, acceptance and love for our “Natural Beauty”. Our desire is to have all contestants feel comfortable expressing themselves through our various competitions while exuding their natural beauty and true essence. Our pageant strongly encourages contestants to participate without beauty enhancements and our judges are advocates of our philosophy." Not only are there fabulous prizes but there are huge promotional opportunities for you and your projects! This event will be highly promoted, a Red Carpet Event, with media/social networks,magazines, online tv shows etc. interviewing on the carpet. 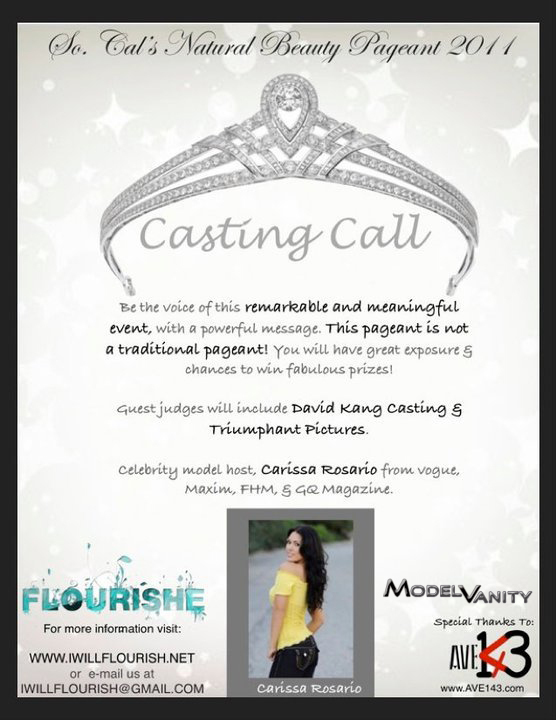 Our goal is to associate High-Profile names and companies with this event and so far we have one the most famous Casting Director's in Hollywood, "David Kang" as a judge; a noted Productions company, "Triumphant Pictures" as a judge; and the beautiful Maxim-FHM-Vogue-GQ model "Carissa Rosario" as our host! We also have "Local Matters" with Charter Communications (Inland Empire cable network) and Model Vanity Magazine providing media coverage & Photography provided by Steve Bitanga and Rey Trajano! We are working hard to confirm more fabulous people to our roster! This event has a meaningful purpose and goes to a great cause! I really want to see everyone who is involved to "actively" GIVE BACK to the cause. There is a $60 donation fee for contestants in your category. PLEASE PLEASE PLEASE don't let the donation fee run you away.That can easily be worked out. If this is something you find yourself really wanting to be apart of we can take a deposit to hold your spot because honestly, spaces are limited! To get started please submit two of your most "natural" pictures, your age, city your representing via email toiwillflourish@gmail.com along with why you would like to be apart of "So. Cal's Natural Beauty Pageant".